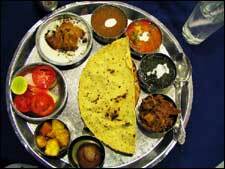 Maharani Thali For Rs. 89 Only At Jiva is an event that took place between 01-Jan-2006 and 30-Jun-2007 in Hyderabad. Next time the family is quarelling over which restaurant to go to for dinner, just pick Ohri's Jiva to set the squabbles straight. These guys have an assortment of all the popular cuisines, and a handpicked melange of the famous dishes are packed into neat little platters. The Maharani Thali consists of paneer curry, Dum Alu, Dal Makhni, Dahi Pakodi, Naan, plain paratha, Jeera rice, Papad, pickle and salad for Rs. 89. You also get a sweet, whether Gulab Jamun, Gajar Ka Halwa or Kaju Katli. It certainly looks a little stingier than the Maharaja Thali but then Maharanis are always the figure-conscious ones. Please contact 98667-78047, 98667-78048 for further details. Be the first to comment on Maharani Thali For Rs. 89 Only At Jiva! Just use the simple form below. fullhyd.com has 700,000+ monthly visits. Tell Hyderabad what you feel about Maharani Thali For Rs. 89 Only At Jiva!